Two terminal dishes assist Army space soldiers of Alpha Company, 53rd Signal Battalion (SATCON) at the Wideband Satellite Communications Operations Center, Fort Detrick, Md. The green antenna is called a replacement terminal and is temporarily supporting A Company's Auxiliary Site Control Terminal mission, while the Modernized Enterprise Terminal (white antenna) is going through testing in preparation to fill a Wideband Global Satellite and ASCT role. The MET is the latest antenna to be fielded with several upgraded capabilities. 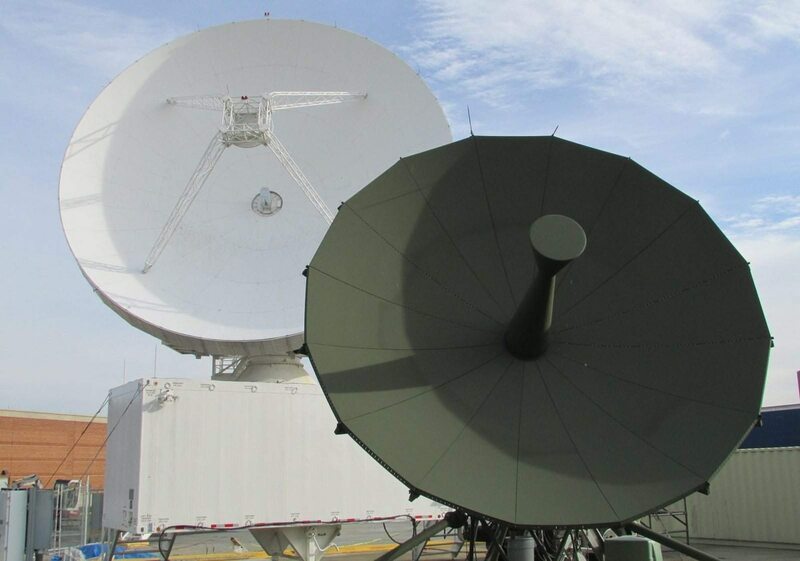 This facility provides Alpha Company controllers increased capabilities to control the communications payloads and communications transmissions of the Defense Satellite Communication System and WGS constellations. During the Reagan National Defense Forum, Gen. John Hyten, the head of U.S. Strategic Command, expressed concerns about the pace of acquisition and new capabilities. I understand his concern and believe that industry and the Department of Defense can help resolve the problems and shrink the gap between the commercial satellite industry’s ability to move faster than the Defense Department. Technology changes too rapidly for any commercial or government entity to just ‘wait and see.’ U.S. national security space resources have been successful in battles up to today, but the current global environment is no longer so simple. Gen. Hyten and many in industry fear America cannot hold today’s position of power without employing new ways to accelerate our acquisition processes. Gen. Hyten sees complacency in the space domain. U.S. satellite systems are becoming targets for enemy jammers and laser weapons. Highly competitive and aggressive technology has created this chaotic landscape around the globe. Hyten is understandably outspoken about changing the Pentagon’s antiquated requirements process to transform space technology, and make significant program delays a thing of the past. He sees commercial manufacturers delivering complex communications satellites in 30-36 months at a fixed price and wants the DoD to incorporate these effective commercial methods today. Complacency and slow action in DoD space can no longer be the norm. Despite his apprehension, Hyten has hope for the future. He believes that drastically changing our satellite procurement process will bring greater technology readiness and agility. Deploying smaller, lower-cost satellites together with resilient networks will allow for easy replacement when space assets fall under attack. In my own experience, I have seen the processes that significantly limit DoD’s deployment of advanced communications capabilities. I have witnessed requirements processes that do not accept an 80 percent solution, and then add considerable ‘boilerplate’ to the specifications. Both of these issues lead to long program delays and result in capabilities that are woefully outdated by the time the system is delivered. Inefficiencies grow even more as the last 20 percent of most solutions drive the process, schedule and risk. If DoD leadership wants a real transformation, other commercial tenets need to become central to acquisition. Commercial industry plans for spiraling technology upgrades or a total system replacement within three years. We apply a “throw away and replace” mentality because today’s technology will be obsolete within a few short years and require upgrades. While many components of DoD communications systems are expensive (predominantly the radio frequency sections), open interfaces and low-cost or software-definable modems should allow the DoD to employ similar technology upgrade practices. Commercial technology leaders know that these are major shifts for DoD, but what’s the alternative? Air Force Secretary Heather Wilson joined Gen. Hyten at the Reagan Forum and agreed with his sentiment. At the Forum, she said, “This is not revolutionary technology … We’re just trying to build something that is well developed. So get after it and get the bureaucracy out of the way.” Both leaders hope for agile capability, delivered well before 2029. Today’s current acquisition strategies separate the key elements of each satellite system — space, ground and terminal — putting all on different schedules with different primes and government program teams. To achieve the above goals, DoD must recognize that the three elements are closely intertwined when forming a single communications system. The passion from Gen. Hyten and Sec. Wilson matches the sentiment of the commercial industry. Commercial satellite technology providers applaud the focus on faster, more agile acquisition. Let’s see if we can review and transform the process together, as we need to accept that working collaboratively is the only viable option. The DoD needs to understand the difference between buying a communications system and buying an aircraft carrier — one acquisition process does not fit all. Around 1990, the commercial wireless industry started to grow dramatically and become the leader in technological innovation. Yes, commercial industry moved in this direction by building on concepts and foundations put together by the DoD earlier in the 20th century. Our war fighters depend on DoD leaders to accept the reality of commercial innovation and use it to the U.S.’ advantage. They deserve more effective decision-making about technology to help successfully reach their mission goals and, overall, maintain U.S. space dominance. Rick Lober is the vice president and general manager of Hughes Network Systems’ Defense and Intelligence Systems Division.